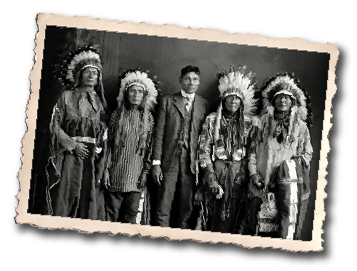 Need help identifying a Native American Ancestor? Our talented staff of professional researchers can find out if you are eligible for tribal membership and government benefits! Untangle the truths in your family’s oral history from embellishments that have been introduced with each retelling of the story. Trace your family tree and obtain the documents required for proof of eligibility for tribal membership. Once your Native American ancestry is proven and your quantum blood is determined, your Native American ancestry enables you and possibly other American Indian descendants who are related to you to qualify for tribal membership and receive benefits from such tribes as the Cherokee, Choctaw, Creek, Seminole and Chickasaw Indians, among others. Native American genealogy is unique when compared to other types of genealogical research. Most of the records available for researching Native American ancestors were created by the U.S. Government. Those records include Indian rolls, censuses, applications and enrollment cards, annuity and allotment records. They were created when Indians filed claims against the United States–generally for treaty violations. When courts found in favor of a tribe, benefits were awarded by the U.S. Court of Claims. but before a claim was paid, applicants had to produce documents that proved they were Native American or related to a Native American. Applicants also had to meet quantum blood requirements (meaning they had to have the minimum percentage of Native American blood required) established by a specific tribe and/or the federal government. Once their Native American genealogy was proved, those qualifying were entitled to land allotments and/or annuities awarded by the U.S. Court of Claims. Applying for Membership in the Cherokee Nation? If your ancestors left the Tribe prior to 1906 and settled in other places, such as Tennessee, Arkansas, Kansas, Missouri, and Texas, they lost citizenship standing with the Cherokee Nation. Only enrolled members of the Cherokee Nation named on the Final Rolls and/or their direct descendants can be granted a Certificate of Degree of Indian Blood and/or Tribal Membership. CDIB’s are issued only through the natural parents. In cases of adoption, a quantum of Indian blood must be proven through the biological parents to the enrolled ancestor. A copy of the Final Decree of Adoption must accompany the application for CDIB, as well as the State Certified, full image/photocopy of the birth record. All information will remain confidential.